DSEJ examining charter of demands submitted by USTA. 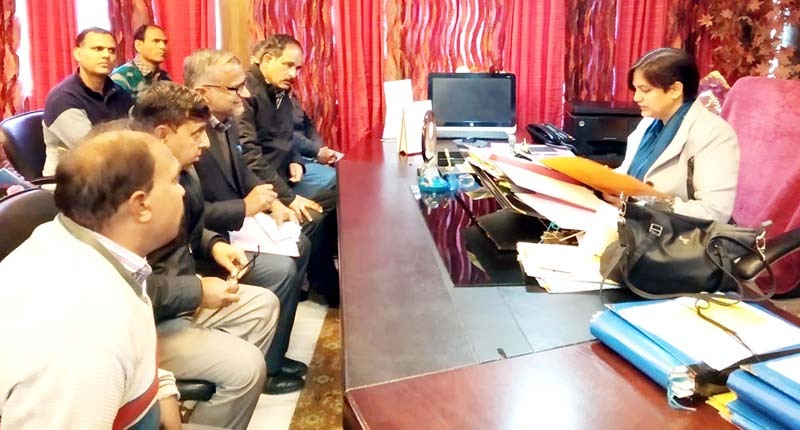 JAMMU, Dec 25: A deputation of J&K United School Teachers Association (USTA) under the leadership of Hari Singh, called on Director School Education Jammu and put forth the charter of demands. The charter of demands seeks release of pending salary for the month of February 2018 and September 2018 in favour of Teachers/ Masters working under SSA and RMSA schemes, implementation of 7th Pay Commission in favour of under graduate teachers, regularization of left out un-regularized Rets/EVs converted ReTs who have completed 5 years service, release of Senior Teacher grade in favour of trained undergraduate teachers, implementation of Government Circular No. Edu/Acctts/TBP/Pay/38/2018/213 dated 23/02/2018 in favour of undergraduate teachers and remove disparity in their grade. The USTA also demanded to regularize all incharge lecturers/ headmasters/ ZEOs etc, fill up all vacant posts of headmasters/ ZEOs and lecturers by way of DPC after every six months including class fourth, clear pending time bound promotion cases by releasing monetary benefit from due date, start pre- primary classes with infrastructure in all schools having primary classes, debar teachers from Non academic duties(BLO etc), provide computer teachers for proper functioning of call centers in schools, adjust large number surplus Masters/ Lecturers on vacant posts keeping in view their previous 3 tenure and suitable transfer of Masters, Lecturers and Headmasters who have completed their tenure in far flung areas of winter as well as summer zones. The Director School Education gave patient hearing and assured to resolve certain demands which are in his capacity. The delegation comprised of Rajeev Kumar, Raj Kumar, Roop Chand, Sunil Thapa, Pradeep Singh, Angadh Singh, Shankara Singh, Bali Mohd, Madan Singh, Ganesh Dutt, Ramesh Kumar, Rashpal Singh and Thuru Ram.